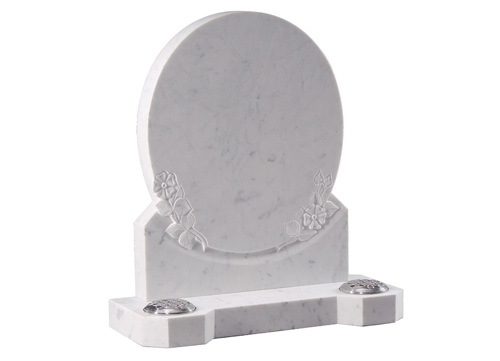 Please browse through our selection of Marble Lawn Memorials below, if you would like further information please telephone us on 01225 763074 or request a memorial brochure to be sent to you at home. The price shown excludes VAT. Cemetery and churchyard authorities nearly always have guidelines for the types of memorials they will permit. Certain varieties of stone are more appropriate in some places than others, not only for their appearance but because of the effects of weather or local conditions. There are also limited to the designs of memorials that are acceptable. We can advise you about local attitudes and rulings. When you place an order, you will be asked to pay a deposit, with the balance of the agreed price payable on completion. The availability of materials, the complexity of design and the condition of the ground will affect the time it will take to complete. Our representative will advise you of this and, if required, will help you with the inscription. Make sure the order shows the agreed wording correctly as you want it to appear on the memorial. Confirm any alterations or additions immediately and in writing. Our reputable firm (established for over 220 years) will endeavour to give you every assistance and guidance in this most important choice. Insurance against accidental damage, theft and vandalism for the memorial is strongly advised. We will be pleased to provide full details of the available schemes. Our Step by Step guide, has been designed to help you through what information is needed. View our selection of Memorial Designs or we can help you create your own. A selection of text and verses that can be used on a memorial as a tribute to a loved one. View some illustrated samples we are able to offer in Granite and Stone.